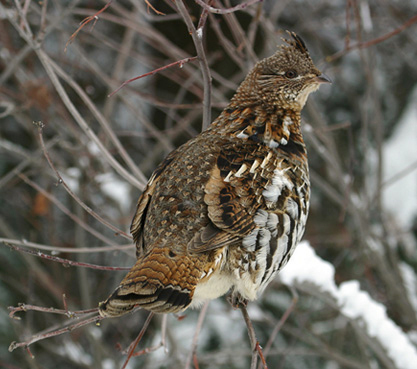 The Ruffed Grouse is the most widely distributed native game birds in North America. Though small isolated populations can be found west of the Appalachians and south of the Great Lakes states, by far the largest populations thrive in regions where snow covers the ground from at least late fall to early spring. The birds, ranging in size from about 17 -25 ounces, are hearty survivors of severe winter weather that often takes its toll on other species of game birds. The male grouse, with his iridescent black neck “ruff” attracts females with his territorial “drumming” in which he beats his wings against the air to create a vacuum while displaying himself by fanning out his tail feathers from a fallen log known as a “drumming log”. After mating takes place, the female wanders off in search of a nest site that can be as far as half a mile away. After she lays her clutch of 8 -14 eggs over a period of up to two weeks, the eggs are incubated for 24 – 26 days before the chicks hatch. The tiny birds require protein for muscle and feather development and are fully mature by 16 weeks of age. Ruffed grouse generally have a short life span due to natural predation, sometimes disease or parasites or severe weather. Ruffed grouse are lauded as one of the most difficult to handle upland birds that field trials are competed on. Their behavior is dependent on how much in isolation they are from human beings. They display their best escape tactics where they are heavily hunted and on field trial grounds. While many American game birds may well demand the respect of the confirmed grouse hunter, the present day ruffed grouse is far more of a problem for a dog to handle than any other. He is the craftiest of all game birds. In covers of ordinary size, a grouse appears to know when the gunner and his dog enter it, unless the wind is heavy. Hearing and knowing the point of intrusion, the bird appears to take stock of the situation immediately and lays a plan for escape should the intruders prove possible enemies. He may decide to run out to some convenient edge whence he can take wing should the pursuit turn his way. He may risk the chance of lying tight, trusting that he will be passed by undetected. Again, he may wait until he is sure he is being sought and then run well ahead and then flush while concealed by a protecting rise of land or a mass of cover. Yet again, should he be caught unawares, as he sometimes is, he will run ahead, not daring to show himself in the air, turn suddenly to one side or the other and then lie close where, likely enough, he will escape the nose of any but the most alert and experienced dogs. Careless dogs follow the trail easily enough but do not detect the sudden tangent until both they and the hunter have passed on. Then the grouse will either slip away afoot or in a bold dash on wing that usually takes both dog and hunter off guard. There seems to be no end to the strategy of the grouse as he executes his masterly retreats. It is only after a long experience of grouse hunting that those who follow the ways of this wise bird come to realize the problems of the grouse dog that is suppose to locate, point and hold him. It is only after long experience, also, that the dog itself comes anywhere near mastering the situation and becomes an exalted figure in the bird dog world. *William Harden Foster was also a breeder, handler, reporter and respected judge of field trial dogs. 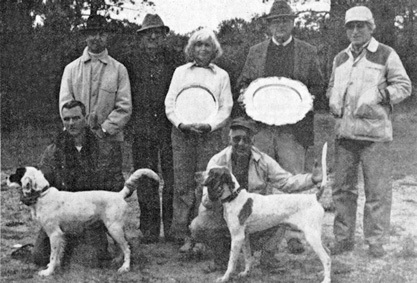 During the mid 1970s, following AFTCA secretary Miss Leslie Anderson’s instructions, a handful of Michigan grouse enthusiasts led by president of the Michigan Chapter of the Ruffed Grouse Society, Dale Hernden along with Jack Nicholson and Jack Stuart started the Ruffed Grouse Field Trial Club to run amateur events in order to fulfill the requirements necessary to have a national amateur championship sanctioned by the AFTCA. After the club’s successful running of the National Amateur Grouse Classic in 1976 and 1977, the request was made and put on the agenda of the next AFTCA’s Annual Directors Meeting. Dale still has the correspondence from Miss Leslie, as she was affectionately known, regarding the process and the official letter notifying them of the board’s approval to run the first National Amateur Grouse Championship. The National Amateur Grouse Championship rotates between the three areas of the country where grouse trials are held: the Midwest, Mid-Atlantic and New England. It is a highly sought after win by amateur grouse trial enthusiasts. The inaugural running of the National Amateur Grouse Championship took place on October 13, 1978 on the Gladwin Field Trial Area near the town of Meredith, Michigan. 18 English setters, 2 pointers, and 2 Irish setters competed with Holly Gray and Rich Tuttle judging. The stake, deemed a grand success by all in attendance, was won by English setter male Pleasant Valley Clyde, owned and handled by Dr. James Stiteler. Runner-Up went to pointer female Kumari Elhew Suzie handled by her owner Vic Christopherson. Suzie was winner the following year!